South Korea's largest automaker today said fuel cell cars represent a bigger opportunity than electric cars. Despite slow market uptake, Hyundai Motor Co. said today that hydrogen fuel cell vehicles represent the future of eco-friendly cars more than all-electric vehicles. Hyundai, the largest carmaker in South Korea, began selling its Tuscon Fuel Cell SUV last year, but only 273 out of a target 1,000 vehicles were purchased or leased. 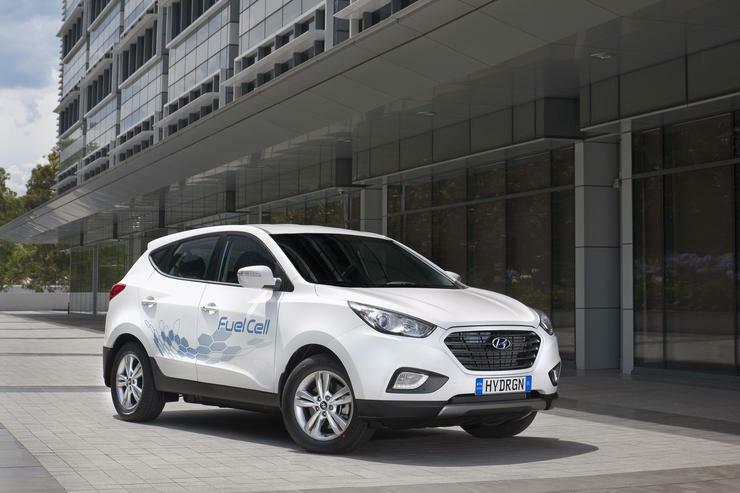 Most of the Tuscon Fuel Cell vehicles, which retail for $US76,000, were purchased in Europe and California, according to reports confirmed by Hyundai America. Over the next four years, Hyundai plans to invest another $US10 billion in hybrid cars, electric battery vehicles and hydrogen fuel cell models. Fuel cell vehicles, however, represent a better opportunity for growing sales -- even over electric vehicles -- because there is less market competition, according to Kim Sae Hoon, general manager at Hyundai's fuel cell engineering design team. The hydrogen vehicles also offer grater flexibility for designers, in that they can scale in size from small cars to buses, Hoon said. Hydrogen fuel cell vehicles are already being used in trucks and buses. That's an advantage for hydrogen vehicles since all-electric engines don't perform as well in larger vehicles, which require bigger batteries that need more charging, according to Devin Lindsay, IHS Automotive's senior analyst. In addition to Hyundai, Toyota released its Mirai fuel cell last December with a base sticker price of $US57,500. Hydrogen fuel cell vehicles emit only water vapor as exhaust. They also have remarkable advantages over all-electric vehicles, such as the Tesla Model S, in that they can travel 300 miles on a tank of fuel and can refuel in just five minutes. By comparison, a Tesla using the company's so-called "Superchargers" requires at least 20 minutes to achieve a half-charged battery. A full charge will provide a range of up to 265 miles. Toyota's RAV4 electric vehicle can go a maximum of 125 miles on one charge. The Hyundai Tucson ix35 Fuel Cell (the European model), can travel up to 369 miles and the U.S. model can achieve up to 265 miles on a single fill up. High prices and the dearth of fueling stations are barriers to sales of fuel cell vehicles. Hyundai said it will be another 10 years before hydrogen cars start gaining wider acceptance. Today, hybrid cars and electric vehicles are dominating the green-vehicle market. There are several methods for creating hydrogen fuel, but the most common today is called steam-methane reformation, a process by which high-temperature steam (1,000 degrees Celsius) creates a reaction with methane gas in the presence of a catalyst to produce hydrogen, carbon monoxide and a relatively small amount of carbon dioxide. The carbon dioxide and other impurities are then removed through a process called "pressure-swing adsorption," leaving essentially pure hydrogen. Steam reformation can also be used with ethanol, propane or even gasoline to produce hydrogen. Steam-methane reformation is most commonly used by oil refineries, which then use the remaining hydrogen to remove impurities, such as sulfur, from petroleum and diesel fuels. As was the case with all-electric vehicles when they first emerged in the mid-2000s, high prices and the lack of fueling stations have stifled uptake of fuel cell vehicles. In a statement, Hyundai said it will take another decade before hydrogen cars gain wider acceptance.